The Boston Police Department reports arresting a woman who was wanted for a Sept. 21 murder in Brooklyn. 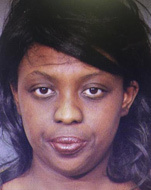 The department's fugitive squad found and arrested Chivona Hughes, 32, in her old neighborhood, along Blue Hill Avenue in Mattapan, police say. Police in New York had been searching for Hughes for a Sept. 21 murder in which the victim was stabbed 75 times in the chest and head. In a statement, the Boston Police Department says its detectives found her in Mattapan on Tuesday, just a day after beginning their search. "Hughes, who initially gave investigators several false names, was taken into custody and charged with being a Fugitive from Justice." Hughes was no stranger to violence in Boston. "Hughes headed back to Mattapan and dropped off some of the occupants of the van at their homes. Shortly thereafter, the group met at Reid's home [Reid was one of the men in the minivan]. Reid gave Hughes a bottle of window cleaner and instructed her to 'wipe off the van.' Reid told her that she would 'be okay if [she] didn't say anything.' In response to a question posed by Reid, the defendant remarked, 'We got him.' Hughes wiped down the van and left in it. She picked up two "crackheads' and then was pulled over, at about 3:30 A. M., by police officers on Evelyn Street in Mattapan. The officers took Hughes and the other two individuals back to a police station for questioning. Initially, Hughes lied to police because she 'was scared for [her] life.' "